We’re doing Key Matchups a bit differently for the Super Bowl. 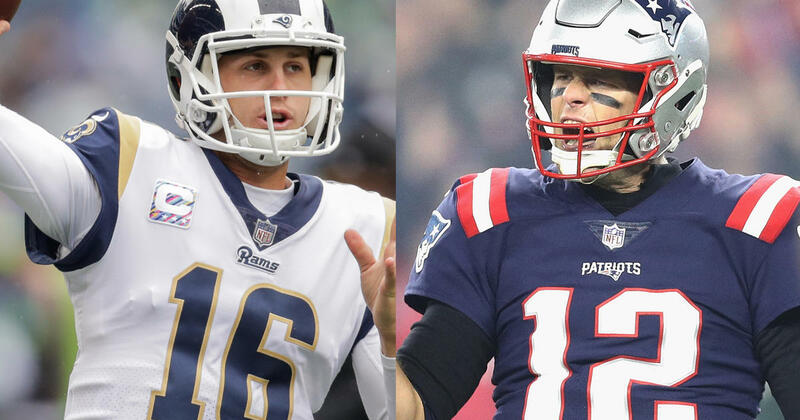 Rather than looking at one specific matchup on each side of the ball, we’re getting into in-depth breakdowns of all the different matchups that can possibly affect the outcome of Super Bowl LIII, so we can really get the full picture of what will determine whether the New England Patriots or the Los Angeles Rams take home the Lombardi Trophy. There’s no need for a long preamble here. Let’s get right into it. We’ll get into the stylistic and play-calling matchup between Phillips and Patriots offensive coordinator Josh McDaniels in our coaching matchups post, but the mind games played between Phillips and Brady will be just as important to the ultimate result of this game. Brady changes play-calls at the line of scrimmage as often as any quarterback in the league, and his skill at identifying rushers, changing protections, and getting the ball out as quickly as possible to the receiver most likely to be open the soonest after the snap is likely the single greatest asset he has. It’s served him extremely well in certain matchups against Phillips’ defense in the past, but it’s worth noting that Brady has had some of his worst games against Phillips-coached defenses in recent seasons. That 2015 Denver Broncos, for example, were famously able to frustrate Brady into what was likely the worst playoff performance of his entire career. If Phillips is able to scheme his pass rush into position to generate pressure on Brady quickly enough that he has to move off his spot in the pocket, that will go a long way toward putting the Rams in position to pull off an upset. But if Brady is able to neutralize the pressure, it could be a long evening for the Rams’ back seven defenders. New England’s offensive line might have been the best in the league this season. According to Football Outsiders, the Pats ranked first in Adjusted Sack Rate; and per Pro Football Focus, Brady was pressured on only 25.8 percent of his drop-backs this season, the third-lowest rate in the NFL. That pressure rate was 8.1 percentage points south of the NFL average, which is the single best mark of the PFF era (since 2007) for the Patriots. During the playoffs, the Pats have been even better up front than they were during the regular season. While Brady’s pressure rate of 25.8 percent during the year was already absurdly low, it has plummeted to a completely ridiculous 15.6 percent in two postseason contests. In fact, Brady has not even been sacked during New England’s run to the Super Bowl. And he has been hit while throwing the ball only one time in 90 attempts. The offensive line will face its toughest task yet during the Super Bowl. Aaron Donald is likely the single best player in the NFL. He led the league in tackles for loss, sacks, and total pressures (sacks plus hits plus hurries) this season, and it’s not like this was some whole new level for him. It’s his normal. Bill Belichick unironically called him “unblockable” earlier this week, and we should expect the Patriots to game-plan accordingly. Pats beat writer Ben Volin told our own Will Brinson he expects the Patriots to double or triple-team Donald and Ndamukong Suh on nearly every snap, forcing Brockers, Fowler, and Sam Ebukam to beat them up front. If Brady has adequate protection, his go-to guy on the perimeter is Julian Edelman. Edelman has four-plus catches in 13 of the 14 games he’s played this season, and this year was his fifth healthy season in a row averaging at least six catches per game. (He’s remarkably consistent, averaging between 6.1 and 6.8 catches and between 66 and 77 yards per game every single year since 2013.) As usual, Edelman spent most of his time in the slot this season, aligning there on 67 percent of his routes, per Pro Football Focus. Interestingly, if Edelman is seeing a ton of target volume, that might not necessarily be a good thing for the Patriots. They were undefeated (10-0) this season when Edelman had 10 targets or fewer, but just 1-3 when he had 11 or more. Since 2013, however, the Pats are 19-4 (0.826 winning percentage) when Edelman gets 11 or more targets in a game, and 36-8 (0.818) when he gets 10 or fewer. In other words, they’re almost always really good and it might have just been a fluke that they lost in his highest-volume games this season. This is where the Patriots feel the loss of Josh Gordon, who once again violated the league’s substance-abuse policy and is once again seeking treatment. After jumping out to a strong start in 2017, Hogan’s production has fizzled over the past year and a half and he is not necessarily a consistent part of the offense. Dorsett, meanwhile, was acquired in a preseason trade in 2017. He barely did anything during his first year with the team but made some splash plays this year, and appears to have Brady’s trust in the red zone, which means he could be a factor when they get close to the goal line. Dorsett made his greatest impact during the first four games of the season while Edelman was injured, racking up 16 catches for 165 yards and two scores. He then went quiet for the better part of the regular season (11 catches for 91 yards from Week 5 through Week 16) before re-emerging in the regular season finale and the playoffs with 10 grabs for 104 yards and three touchdowns. Neither player seems all that likely to dominate a matchup with the Rams’ perimeter corners, though it is worth noting that Peters has been susceptible to double moves throughout his career and has noticeably come up short in several big games this year. Talib, however, has been fantastic throughout the year (when healthy), and has had a dramatic effect on the Rams’ pass defense with his presence alone. The Rams allowed a passer rating of just 69.0 with Talib on the field, but when he was either on the sideline for a rest or out with an injury, that rating skyrocketed to 108.6. Because the Patriots’ perimeter receivers are so much less threatening than their other targets, however, Talib may actually have a different role in this particular game than his typical spot at left cornerback, where he played 92 percent of his snaps this season, per Pro Football Focus. Rob Gronkowski was not his usual self this season. The burly tight end posted his worst receiving numbers since his rookie year, when he was part of a tight end timeshare, and he looked noticeably slower and more hobbled than ever before as he maneuvered through opposing defenses. He really only had two Classic Gronk games during the regular season, a seven-catch, 123-yard, one-touchdown performance against the Texans in Week 1 and an eight-catch, 107-yard, one-touchdown destruction of the Dolphins in Week 14. We saw during the AFC title game, however, that Gronk can still reach back into the reserves when he has to and come up with huge plays at the most opportune times. He beat Eric Berry down the left sideline for a huge fade to set New England up for a touchdown opportunity, and he later beat Berry again on a third-down slant to pick up a conversion. He finished the game with six catches for 79 yards, both of which are more than he had in the Patriots’ previous four games combined. Stopping Gronk from dominating up the seam, over the middle, and on the perimeter is not a one-man job. It’s going to fall to the Rams’ safeties, but also possibly Talib. Back when he played with the Patriots, Bill Belichick would occasionally use Talib against a star tight end in order to take that player out of the game, and it would not be surprising if Phillips tried to do the same on Sunday. It would necessitate playing man coverage more than the Rams typically like, but it might be worth it if it means neutralizing Gronk. Did you see what Alvin Kamara did against the Rams during the NFC title game? Drew Brees was throwing to him on practically every play, and Kamara ended the game with 11 receptions for 96 yards. He split his damage equally against Littleton (5-36) and Barron (4-34), and the Saints notably took advantage when a coverage scheme got him matched up against a defensive end. Expect the Patriots to do everything possible to generate the same types of looks for White, who is perhaps the best pass-catching back in the league and spent much of this season operating as Brady’s de facto No. 1 receiver. The Patriots also put some interesting looks on tape during their title game win over the Chiefs, running with White four different times on third and short, including three times out of shotgun. 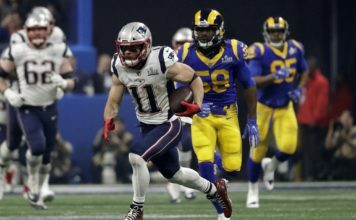 Both of those things are so extraordinarily rare for the Patriots that it almost seems like they did it specifically to put it in the Rams’ heads that it’s possible they might do it again during the Super Bowl, so they can get an extra linebacker or lineman on the field and just keep throwing it. White was the best player on the field during the Patriots’ Super Bowl win two years ago, and if he can put together a performance that looks anything like that one (6 carries, 29 yards, 2 rushing TD, 14 catches, 110 yards, 1 receiving TD), let’s just say the Rams will be in trouble. New England had an excellent run game during the regular season, and the Patriots have become an even more run-heavy team in recent weeks. They called for a run on 49 percent of snaps from Week 12 through Week 17, the third-highest rate in the NFL, according to Sharp Football Stats. They had a 53 percent success rate on those runs, making them one of the best rushing teams in football. During their two playoff games, they’ve been nearly as run-heavy and nearly as successful: 48 percent of their playoff plays have been runs and they’ve been successful on 51 percent of those plays. The blocking up front for Michel and Burkhead has been terrific. During the season, the Pats ranked third in Football Outsiders’ Adjusted Line Yards. They also ranked fourth in stuff rate, allowing only 15.9 percent of runs to be stopped at or behind the line of scrimmage. That blocking helped New England to the ninth-most efficient rushing attack in the league, per DVOA, and it helped Sony Michel rank ninth in rushing success rate out of 47 players with 100 carries or more during the regular season. Michel also ranked 13th among the 60 running backs who played at least 250 snaps this season in yards before contact per attempt. The Rams’ regular-season run defense left a lot to be desired, ranking 28th in DVOA and 21st in both Adjusted Line Yards and percentage of runs stopped at or behind the line of scrimmage (16.4 percent). During their two playoff games, however, the Rams have held the Cowboys and Saints — two elite rushing teams — to 98 rushing yards combined, on 43 carries. That is an insane 2.28 yards per carry average. The running backs from the Rams’ two playoff opponents averaged (I swear this is a real number) 0.09 yards per carry before contact during those games, which, again, I swear is a real number. That type of performance will be difficult to duplicate against the Patriots, naturally, but you never would have thought it could be done against the Cowboys and/or Saints, either. Jared Goff is 24 years old. This is his third year in the NFL and second as a full-time starter under Sean McVay. He’s been quite good these past two years, and he made some fantastic throws during the NFC title game against the Saints. He is a huge part of why the Rams are even in this game. But he is going up against a whole lot of bad history, given the success rate of young quarterbacks like himself against the Patriots during the Bill Belichick-Tom Brady era. Since 2001, quarterbacks under 25 years old have started 61 regular season and postseason games against the Belichick-Brady Patriots. Their teams are just 12-49 in those games, yielding a 0.197 winning percentage that is the equivalent of a three-win season. Their passing performance in those games is … not good. So, that’s not great. And it’s not much better if you isolate the playoff games. Under-25 quarterbacks are 2-5 in seven playoff starts against the Belichick-Brady Pats, though one of those wins was by Joe Flacco in a game where he went 4 of 10 for 34 yards and an interception while his defense dominated. Belichick excels at taking away what you do best offensively and making you, in boxing parlance, fight left-handed. You have to play to your weaknesses in order to win, because he is going to take away your strengths. The Rams have one of the most creative offensive systems in the league and Goff has shown terrific ability to work within it. But in games where teams have taken away what the Rams do best (play-action passing), he has struggled. The stretch from Weeks 13 through 15 showed the downside for the L.A. offense, and they need to figure out a way to avoid that on Sunday. Remember everything we said about how good the Patriots’ offensive line is? Well, that all applies to the Rams as well. L.A. finished the regular season ranked first in the NFL in Football Outsiders’ Adjusted Line Yards, which assigns credit in the run game to the offensive line based on a percentage of yards gained per carry. They also had the second-lowest percentage of their runs stuffed at or behind the line of scrimmage, at just 14.6 percent. Additionally, the Rams ranked sixth in Adjusted Sack Rate and allowed Jared Goff to be pressured on only 32 percent of his drop-backs, a below-average figure. Goff has the second-lowest pressure rate of any quarterback during the playoffs (23.6 percent), behind only Brady. Goff has been hit while throwing the ball on three times on 68 playoff passes, and he’s been sacked just once. Getting pressure, meanwhile, was a surprising strength of this New England defense; they recorded a sack, hit, or hurry on 37 percent of opponent drop-backs, per Pro Football Focus, an above-average mark. They got pressure 36 percent of the time when rushing four and 45 percent of the time when rushing five or six, indicating that their blitzes were often successful. Their best pressure player was Trey Flowers, who lines up all over the place and produced 7.5 sacks, 20 quarterback hits, and 52 total pressures during the regular season. It’s worth noting that run-stuffing defensive tackle Malcom Brown popped up on the injury report on Wednesday, and though his playing time has dropped during the playoffs, he is still a valuable piece of the puzzle up front. If he’s unable to go, New England may have to turn to someone like Danny Shelton to eat up blockers up the middle. How the Patriots approach this matchup is one of the most fascinating tactical intrigues of the game. With Cooper Kupp out of the lineup, the Rams use Brandin Cooks and Josh Reynolds as their perimeter receivers most of the time, while Robert Woods mans the slot more often than not. Cooks aligned on the outside on 71 percent of his snaps this season, favoring the left side of the field (55-16), while Reynolds lined up outside on 67 percent of his snaps, mostly favoring the right (48-19). The Patriots can shadow Cooks with Stephon Gilmore, their best cover corner, having him follow Cooks no matter where he aligns on the field. They have been more willing to shadow with Gilmore than almost any other corner during the Belichick era, and they even used him to occasionally go with Keenan Allen when he bumped down into the slot a few weeks back — something that’s very rare for the Patriots’ defense. The Patriots can assign Gilmore to Josh Reynolds, and bracket Cooks with J.C. Jackson (or Jonathan Jones, who came in for Jackson when he took a few penalties during the AFC title game) and safety help over the top. This is a strategy the Patriots often used during the one season they had Darrelle Revis, assigning him to completely remove the opposing team’s secondary perimeter receiver from the game while bracketing the No. 1 wideout on every single snap. 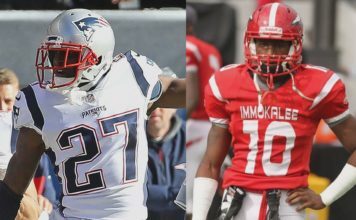 If the Pats choose this option, the bracket help is most likely to come from Duron Harmon, so Devin McCourty can maintain his typical role in the middle of the field. The Patriots can simply have Gilmore and Jackson (or Jones) play sides, and adjust their coverage accordingly based on where Cooks and Reynolds line up. Doing this allows the Rams to dictate what matchups they want, though, so it seems like the least likely of the available options. The Patriots play more man coverage than any team in football and the Rams’ offense, heavy on crossing patterns and mesh concepts, is designed to beat man coverage, so how New England decides to approach this will play a huge role in determining the game. McCourty’s move into the slot back in Week 12 coincided with the major step forward taken by New England’s pass defense, and his role on the inside will match him up with Woods for most of the game. Woods has aligned in the slot on 68 percent of his passing-down snaps since Cooper Kupp tore his ACL, by far the highest mark on the team. He is Goff’s most consistently reliable target, catching at least 67 percent of throws in his direction in 12 of his 18 games this season. Woods also does most of his damage on the short and intermediate throws that form the basis of the Rams’ offense: On throws within 10 yards of the line of scrimmage, Goff is 61 of 76 for 576 yards and three touchdowns when targeting Woods. On intermediate throws 10-20 yards downfield, Goff is 30 of 48 for 525 yards, a touchdown, and two picks. Combined, Goff’s passer rating on those throws is 104.3, several points higher than his overall season-long mark. Since moving into the slot, McCourty has allowed 17 catches for 170 yards, three touchdowns, and a pick there across eight games. That sounds like a lot, but it’s only because he’s been targeted so often due to the excellence of New England’s perimeter corners during that time-frame, and the fact that it’s easiest to complete passes to slot receivers. He’s been quite good, and it will be fascinating to see him go toe to toe with Woods inside. Much like the Patriots, the Rams have leaned even more on the run in recent weeks than they did early in the year. Given their reliance on play-action passes to fuel their aerial attack, that is perhaps not surprising. And what can’t be surprising anymore is the degree of success they have running the ball, whether with Todd Gurley or with C.J. Anderson. The Rams were the best run-blocking line in the NFL this season, ranking first in Pro Football Outsiders’ Adjusted Line Yards, and their outside zone-heavy system was incredibly difficult to stop. The Rams had 280 outside zone carries during the regular season, according to Sports Info Solutions, most in the NFL. They ran for 1,555 yards on outside zone, most in the NFL, and 946 of those yards came after contact, most in the NFL. Those runs resulted in 84 first downs and 14 touchdowns, most in the NFL. And they averaged 5.6 yards per carry on those plays, best in the NFL. They racked up those numbers by dictating defensive formations with their own personnel (more on that in a second). The Rams almost always had one running back, one tight end, and three receivers on the field, so they almost always faced nickel or dime defenses. As a result, during the regular season Gurley faced eight or more men in the box on only 8.2 percent of his carries, the third-lowest rate in the NFL behind only Tarik Cohen and Wendell Smallwood. Anderson, meanwhile, ran into an eight-man box on 11 of his 20 carries during his Rams debut back in Week 16, but has seen eight-man boxes on only seven of 62 carries since, a rate of 11.3 percent that would have ranked sixth-lowest in the NFL during the regular season. It is not at all shocking that Gurley averaged 4.9 yards per carry during the year and Anderson is rampaging with a 5.7 yards per carry average during his four games with the Rams. New England had a slightly below average run defense during the regular season, ranking 19th in DVOA, 26th in Adjusted Line Yards, and just 24th in the percentage of opponent runs stopped at or behind the line of scrimmage (15.8 percent). The Patriots held the Chargers and Chiefs to just 60 rushing yards combined during the past two games, but much of that is simply due to the fact that they jumped out to leads so quickly. Their run defense has really not been tested during the playoffs yet. Surely, you have heard this before: For most of the regular season, the Rams aligned in 11 personnel (one running back, one tight end, three wide receivers) on a near every-snap basis. They even used pretty much the same 11 players on damn near every snap, with their entire offensive line, Jared Goff, Todd Gurley, Brandin Cooks, Robert Woods, and Cooper Kupp playing just about 100 percent of the snaps, and tight ends Gerald Everett and Tyler Higbee splitting the work at that position. Doing this allowed the Rams to make almost all of their offense look exactly the same right up to the point where they snapped off and ran something different, and it was immensely confusing for opposing defenses. But then Kupp got injured, Woods bumped into the slot, Josh Reynolds entered the lineup, Todd Gurley got banged up, teams stopped reacting as strongly to the bells and whistles in the design of Sean McVay’s offense, and they began sitting in zones. The L.A. offense struggled for several weeks before finally getting back on track late in the year with strong performances against a couple of weak opponents. Those get-back-on-track performances came along with a dramatic shift in personnel usage. Take a look at the following chart and see if you can spot the very obvious difference. Increased usage of 12 personnel (one running back, two tight ends, two wide receivers) fueled the Rams’ C.J. Anderson-led running game during the final weeks of the season, as Anderson racked up 299 yards and two scores on 43 carries. The Rams have carried heavier 12 personnel usage into the postseason, though they’ve reverted to a more reasonable 80-15 split, with 5 percent of their plays coming out of either 13 (one running back, three tight ends, one receiver) or empty (five receivers) sets. How the Rams elect to deploy their personnel will dictate which Patriots defensive backs are on the field, and also how many of them are out there at the same time. Lots of 11 personnel would likely mean more Duron Harmon, while 12 personnel would presumably bring lots of Patrick Chung. Plays out of 11 are more likely to see the Patriots respond with five, six, and seven defensive-back sets, while plays out of 12 could bring even out some of the base 4-3 defense.